Pregnancy and the birth of a new baby can stir up different feelings for mothers, fathers and other members of the family. During pregnancy, parents may be reminded of their own less than ideal experiences of being parented or they may have ideas about how being pregnant and giving birth will be and feel confused about how anxious and overwhelmed they are. Other parents-to be have to deal with unexpected medical challenges eg undergoing IVF and the feelings of helplessness that can arise when facing perinatal loss. 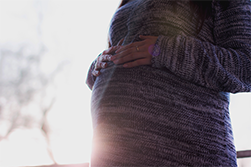 Developing an attachment relationship with the unborn baby may also be confounded by news that there are medical concerns for the baby, or that the couple are expecting more than one baby. “I’m not sure where I would’ve been without the help and support of Julianne this year. Not only did she enable my recovery from previous birth trauma, but she empowered me to take control of the birth of my second son to the greatest extent possible and ultimately achieve the HBAC I longed for. Not only that, but working with Julianne has prompted reflection in so many other areas of my life that I feel I am now more equipped for motherhood overall.